Earlier this week I shared the following image on Facebook and Twitter (click the image to view a larger size). The story detailed within is about legendary wrestler and eventual coach Dan Gable. After sharing the picture, I was surprised to learn that many folks hadn’t heard of Dan Gable. Therefore with this entry, I’d like to share the following documentary in hopes of familiarizing the younger generation with him. Dan Gable is without question one of the most dominant athletes ever. His dominance as an athlete also transferred to an extremely successful coaching career. As the head wrestling coach at the University of Iowa, he led teams to 15 NCAA titles and 21 straight Big Ten titles. The video player below is to a playlist that is split into seven clips. Each will play continuously within the embedded player. The playlist can also be accessed directly through Youtube (click here). The documentary is filled with insight into Gable’s success as both an athlete and coach. He is a true testament to the value of hard and consistent work. His drive and determination was also contagious, as evident by the continued dominance of theÂ wrestlers he coached. 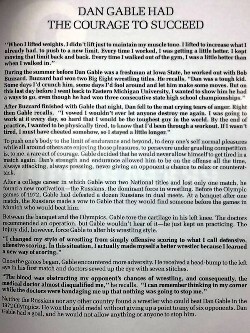 Year after year, Gable’s wrestlers went above and beyond what they would have done elsewhere in hopes of earning the respect of their coach. That alone speaks volumes when debating topics such as potential. Successful coaches can get inside your head, pushing you past self-imposed barriers that wouldn’t otherwise be crossed. I’ve yet to meet anyone who wasn’t capable of improving in some way. No matter how much you’ve accomplished, you can always do more. In summary, whether you have interest in wrestling or not, there is always something to learn from those who have dominated their field. It is rare that you will find an athlete or coach as dominant as Gable. To succeed on both fronts is not a matter of luck. 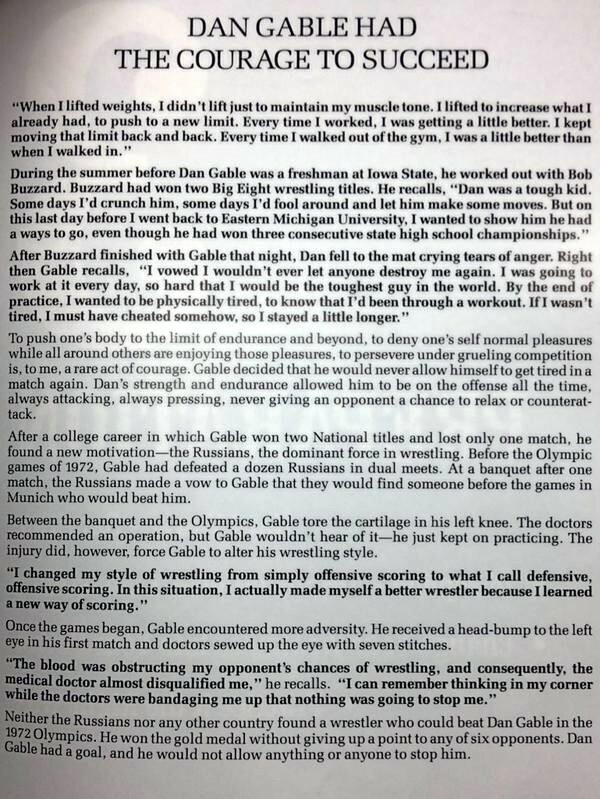 Dan Gable knew how to win and knew how to get others to win. When he speaks, I suggest that you sit down and listen. great post. first time i met dan gable i was grade school at the iowa state wrestling tourney in des moines. got his autograph. i thought he was God. Very motivating. Looking forward to taking the time to watch the videos. Perhaps one of the fittest athletes of any sport in history. This guy was a machine. Inspiration to not only wrestling fans but all fitness enthusiasts. Gable was the original cross-trainer. This guy did it all. Was absolutely “freakish” in his devotion to physical fitness in the way boxer Rocky Marciano was in his quest for fanatical fitness. Skill is great but fitness especially in the combat sports like wrestling and boxing is perhaps your most important attribute. It really is sad that many of the younger generation never heard of this guy.